The Party’s refusal to either share power or make political decision making transparent and open to public debate creates mistrust: just what have they got to hide anyway, inquiring minds want to know. In addition, through its control of cultural resources, including the arts and the right to convene, the Party has demonstrated a refusal to acknowledge any viewpoints other than those that shore up the influence of high-ranking officials. Neitizens and western journalists have responded to Party control over and access to information with reports that (more often than not) conflate conspiracy theories with the “truth”. Not unexpectedly, citizens spend an inordinate of time trying to piece together a big picture out of rumors, veiled allusions and gut feelings. Sadly, the more the Party doesn’t say about Beichuan or Bo Xilai or Chen Guangchen, for example, the more accusatory rumors circulate via the net, weibo, and text messages and with them the festering anxiety that no one can be trusted to speak truthfully. Thus, in today’s China, common sense has it that Party members don’t tell the truth because the truth would harm them politically, while the rest of us are incapable of telling the truth because we don’t know it. Keywords of the day – trust (信任), good faith (诚意), and loyalty (忠诚) – pivot on the relationship between a healthy society and how good our word might be. The characters for person (人) and word (言), for example constitute 信, the first character in the compound for trust. The character word (言) also appears in sincerity (诚, literally “word” “is realized”), which is an element of the expression good faith (literally “sincere meaning”) and loyalty (faithful sincerity). Moreover, the question of belief (信仰, literally a person who trusted and admired) resonates throughout all levels of society and the most trusted forms of organized alternative to Party disinformation and rumor mongering tend to be religious – Tibetan Buddhism, Xinjiang Islam, and popular Buddhism, Falungong, Christianity in Han communities. The article reconstructs the events of May 12, 2008 by giving a quote from Feng Xiang’s decidedly poetic and vague blog and then re-interpreting it in terms of a nuclear blast. For example, in February 6, 2009 post, Feng Xiang wrote, “In 80 seconds, the mountain collapsed, the ground split open, the mountains shook and the earth moved, the river changed its course. The green mountain lost its color, and all I see is disaster. This was Beichuan’s most devastating moment. A level 8 earthquake, with level 11 destruction”. According to Lu Dong, the phrase “the green mountain lost its color” refers to the fact that all the mountain foliage was burned. Lu Deng also analyzes sections where he asserts that Feng Xiang’s original text, including references to a Chief Pan of the Anti-Chemical Corps of the Second Artillery (二炮防防化部隊隊長番号) have been changed. As an opening witness, Feng Xiang (冯翔) is a compelling figure because his position within the Party hierarchy placed in a position to learn the truth, while his loss as a father and a teacher gave him moral authority. Feng Xiang was a teacher and then a vice minister in the Qiang Minority Autonomous County, Beichuan Ministry of Information (北川羌族自治县宣传部). His eight-year old daughter died in the Wenchuan earthquake. 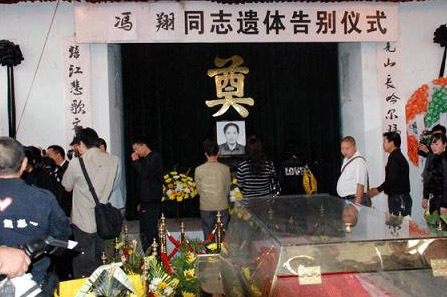 Subsequently, his efforts to uncover the truth about her death led to charges that an underground nuclear explosion rather than the Wenchuan earthquake caused the Beichuan disaster. The truth of his position was confirmed through allegations that Feng Xiang was harassed into committing suicide when he attempted to bring this story to the public. Lu Dong is relentless in his case. He notes differences between the pattern of damage at Wenchuan, which fell away from an epicenter and Beichuan, which fell in a different pattern, away from Longmen Mountain. Evidence from the Tangshan earthquake is brought in. Even at Tangshan, after the quake subsided there were some buildings and trees standing. In contrast, at Beichuan everything collapsed: 498 kilometers of highway, 6066 kilometers of ordinary roads, 1503 bridges, 131 power stations, 8,944 kilometers of electrical transmission lines, 26,000 kilometers of fiber optic cables, 597 water reservoirs, 9,416 kilometers of channels, 282 broadcast stations, and 2,432 different sites of geological disaster. Even more disturbingly, after the 5.12 Beichuan disaster, doctors from Sichuan Medical University, the University of Illinois, and Imperial College released studies documenting that many people and animals in the disaster area suffered from radiation poisoning. In addition, specialists suggested that iodine 131 is a radioactive isotope that could have caused spontaneous abortions similar to those seen at Beichuan. However, the Sichuan Party Secretary ordered a blackout on all reports on over 100 fetuses that had died in utero. If all this wasn’t enough, the Japan Aerospace Exploration Agency reported that an earthquake did not adequately explain the yellow color and condition of vegetation in Beichuan. Lu Dong ominously concludes, however, that these conditions were consistent with the effects of a nuclear blast. And yes, ongoing Party inspection tours and scientific reports from Beichuan seem consistent with the after effects of a nuclear blast and not an area healing from a natural earthquake. Clearly, Lu Dong believes that there were underground nuclear experiments at the Longmen Mountain Facility and that an accident occurred. He is a compelling rhetorician, concluding his argument with the reminder that Hawkish General Zhu Chenghu (朱成虎) has threatened to use nuclear weapons to destroy the United States if the country should ever help Taiwan and calling for the Party to meet face these accusations in court. And there it is. The reason that the Party fears religious organizations. The unstable situation of chronic Party secrecy and corrosive public suspicions has created an environment in which many people “don’t feel safe (没有安全感)”. However, religious groups continue to investigate and make public charges (if even from abroad), rather than hiding behind anonymous weibos and innuendo. The Chinese Christian Democratic Party has thrown down a political gauntlet in a Falungong newspaper, which also publishes pieces that support the Dalai Lama, forcing those of us living in murky half-truths and deliberate cover-ups: when all is said and done, who do you believe? This entry was posted in noted and tagged beichuan, china, conspiracy theory, current-events, environment, human-rights, musing, new social media, news reportage, nuclear weapons, politics, religion, text messages, weibo, wenchuan earthquake. Bookmark the permalink. I am surprised and excited to read your article here which summarize our Investigative Report on the “5.12 Riddle”. I am Lu Dong (David Dong Lu), the author of this report and the spokesman of the Christian Democracy Party of China, and a Chinese American living in New York City since 1986, originally as a F-1 visa student after my graduation from Shanghai Fudan University in 1983. How wonderful to hear from you. Thank you for your efforts to illuminate what is happening in China. The world needs your work to help clarify common questions and possible solutions.